This recipe is from Bernard Clayton's New Complete Book of Breads. It makes about 3 dozen or so buns. 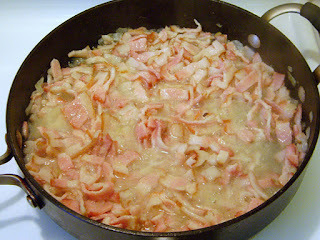 Place chopped bacon and onion in heavy skillet; barely cover the mixture with water. Place skillet over medium heat and boil off the water. In about an hour, the water will be gone and the mixture will have cooked into a rich brown filling. It will crackle and pop to announce it's done. Remove from heat. Drain the grease through a sieve and allow it to drop while it cools. When cool, chop again or run through a food processor to ensure the mixture is fine. In a small saucepan heat the milk and butter until the butter is melted. Don't scald. Remove from heat and add eggs when milk has cooled a little. 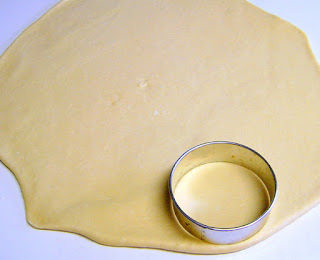 Place dough in greased bowl, cover tightly with plastic wrap, and let rise until it doubles in size, about 45minutes. Punch down dough, gently, cover bowl again and let it double in size again, about 30 minutes. Remove dough from bowl and knead a little to press out bubbles. 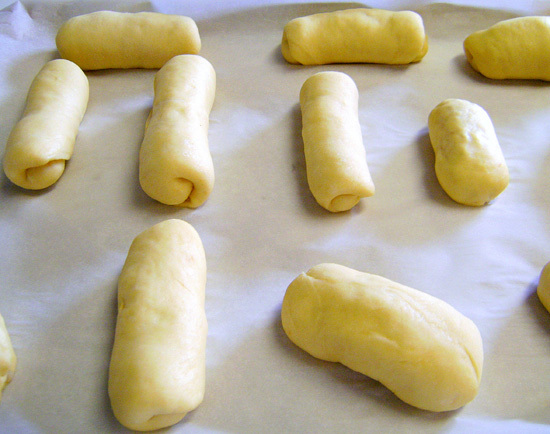 Roll out the dough until it's about ½” thick. Cut out circles with a 2 ¼” cutter placing the circles aside as you cut them. Repeat process until all of the dough has been used. With you palm flatten the circles and spoon about a teaspoon of the cooled bacon mixture in the center of each circle of dough. Draw the sides of each circle up and over the bacon. Tightly pinch the seam together, and place each bun, seam side down, on a baking sheet. Cover the buns with wax paper or parchment and allow to double in size, about an hour. Preheat the oven to 375, let the oven preheat for about 20 minutes. Brush the buns with the egg wash.
Place the buns in the oven on the middle or bottom shelf. Baking takes about 20 minutes for glossy brown buns. Buns can be served warm out of the oven or frozen and reheated for later. Note: I typically add flour until the dough no longer sticks to my hand if I touch it. You should be able to smack the dough with the palm of your hand, and while it may feel wet, it shouldn't stick to your hand when you pull it away. 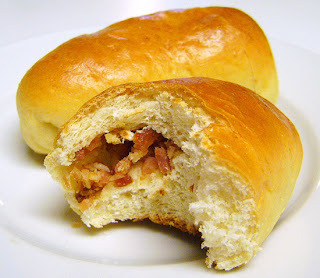 oh no you didn't-bread filled with bacon! This recipe will surely rule the day...my imagination of this just will not do. I want and therefore am inspired. This one is a keeper-yum! I can see why these little bad boys are so popular. I'm inspired to give them a go. Thanks! Christine, I'm so glad you have Peter here today! These bacon buns will hopefully be in my kitchen soon. Sauteed onions and bacon inside bread make a beautifully delicious combo! Picture me making these for my family over the holidays and speaking of this guest post while their eyes glaze over in a polite interest while they happily eat these little treasures! All 3 dozen of them. I hope you both have a great start to your week! We order these from a local bakery on a weekly basis... because they are to die for!! So yummy! Now that I have read your post further, I now see that this is a recipe from the Kitchen noob. This is a great guest post and it is something I definitely would like to try. Few people can resist a bacon filled bun-well done. Peter from The Kitchen Noob shared an awesome recipe with us today. Thanks so much Peter. To Christine- great pick for a guest poster. Well done. Wow - this is a GREAT recipe! Thanks so much for sharing....bacon and bread is an amazing flavor combination! What a terrific Christmas treat! Christine, thanks for posting this special guest post. I'm glad I've learnt something new from here again. Thanks so much for sharing it. You're the greatest. Hope you're having a fabulous week ahead. Though I bake like once a while but this sharing has made it so simple to make the buns, nice filling with the bacon inside. Bread filled with bacon...I'm in! These look like what a former local Polish bakery made on Saturday mornings... they called them bundukie. They even made them with diced jalapeno peppers in them!!! I miss that bakery soooooo much after they closed. They made the bestest biggest cinnamon raisin rolls I have never tasted!!! Not a light fluffy dough but a rich, moist, heavier dough with lots of cinnamon!! Hello Christin, I'm glad that I'm here! We are glad to have you here. Enjoy! My pleasure. I'm happy to have you here. Oh man bacon inside a bun!! These are so cute & I bet soooo amazing! Yum!! These look great--they remind me of stuffed buns served at a Polish restaurant when I was growing up. Buzzed! Bacon, onions and bread - what's not to like? Thank you for sharing this great recipe! I would never think to boil bacon, but after seeing the end result, I'm in! Peter, how fun to see you guest posting for Christine! These buns sound marvelous...a hit for sure at our house! I love Eastern European food, these look fab. I will go check out your blog! Bacon buns!? These buns look so perfect! I would not mind biting into one of these and getting the bacon...mmmmm!!! is off-center, but try making them round instead. The long ones are actually Latvian, but everyone has their own recipe. GOOD LUCK! and good, hearty rye bread. This is probably the fourth time in 2 months that I've made these, they're sooo good! My grandma used to buy these from a bakery all the time and when I found this recipe, I freaked! Can't wait til this batch is done! liked every bit of it and I have you book-marked to look at new information on your website.